Hilton Head Island is a foot-shaped barrier island that measures only 42 square miles. But this semitropical paradise is filled with white-sand beaches, salt marshes, lagoons, and lush forests of mossy oaks, palmettos, magnolia and pine that attract not only two-legged visitors, but also the four-legged and the winged kind. As you explore the endless array of outdoor activities, you are guaranteed to come across some of our natural inhabitants. One of our most famous creatures is the alligator, often seen sunbathing on the banks of the lagoon or just swimming along. Fall and spring are the best times to see these cold-blooded reptiles as they leave the water to bathe in the sun and increase their body temperature. If you have ever golfed on Hilton Head then you will have definitely come across the ‘gator’! It is illegal to feed the gators for a number of reasons, mainly because they can outrun humans and most other animals in short distances; and when provoked, they become aggressive. It is safest to stay away from the banks of the lagoons. For guided kayak tours of our local lagoons and more information about the local alligator go to outsidehiltonhead.com. Bird watchers, you are in the right place! 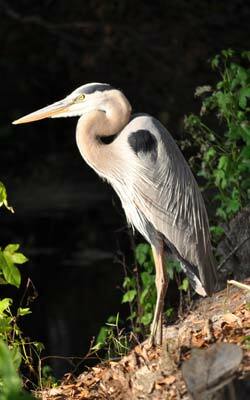 Other than the beach, the best places for bird watching on Hilton Head are the Sea Pines Forest Preserve and the Audubon Newhall preserve on Palmetto Bay road or off island is the Pinckney Preserve. For a guided tour check out the Alligator and Wildlife tour located in the Sea Pines Forest Preserve. The most common bird to find on the beach is, of course, the Seagull. Other very common shore birds, known for their longer legs are Brown Pelicans, Tern, Egret, Black Skimmer, and Osprey. Only 10 years ago, Osprey sightings were quite rare. Today, the numbers have bounced back and you will often see Osprey diving from great heights to catch his prey in the waters below or nesting in TV and electrical towers. Another bird that has made a comeback in the Lowcountry is the Bald Eagle. We have three known nesting families of Bald Eagles currently living on and around the island. If you ever look out your window and notice an island that was not there yesterday…it is not a mirage…it is thousands of birds floating together in the water! These are Scaup, a type of duck, and the ‘island’they form is called a raft. Another famous friend of the island is the Loggerhead Sea Turtle, an endangered species protected by federal law. In the spring and early summer, the loggerhead females come to the island to nest. They often arrive at night and will dig a hole by the soft sand near the dunes. She will lay approximately 100 eggs, bury them, and return to the sea. Approximately 2 months later, the baby loggerheads will hatch, crawl out of the sandy nest, and make a run for the sea. Only 1 in 10,000 loggerhead eggs will become an adult. There are many enemies the baby loggerheads will have to deal with before they even reach the sea; raccoons, birds, crabs and humans just to name a few. Another problem they are faced with is the fact that they are guided from the nest to the sea only by the reflection of the moonlight on the sea. The problem is, if people occupy the homes on or by the beach and have their lights on at night during hatching season, the lights from the homes confuse the hatchlings, leading them away from the sea and toward the houses and almost certain death. The laws that protect Loggerheads are very strict for anyone that disturbs a nest or interferes with their survival in any way, including having their lights on at night. The penalties for disruption and endangerment of the turtle can be enforceable with a fine of $895.00, payable by the party currently staying in the home. These laws are enforced from May 1 – October 31. If you see a problem with Loggerhead nests or hatchlings, call the Coastal Discovery Museum at (843) 689-6767 or the Sheriff at (843) 785-3618. Do not try to help – fines go to six figures and jail time can be imposed. The dolphin is everyone’s favorite animal! You will often see them off the shore in the ocean, playing in the waves or just out looking for a snack. Since dolphins are air-breathing mammals, they are easily spotted when they come up for air. 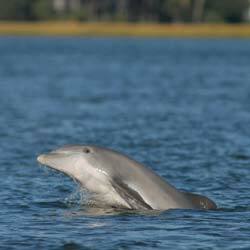 The waters around Hilton Head Island are one of the few places on Earth where dolphins routinely use a technique called “strand feeding” whereby schools of fish are herded up onto mud banks, and the dolphins lie on their side while they feed before sliding back down into the water. One of the best ways to get a close encounter with this friendly local is an eco-tour. Enjoy beautiful Hilton Head Island by charter with H2O Sports. Join them for your family adventure. Explore the wondrous waters of the low country on an amazing Dolphin excursion or sail along with playful dolphins in your wake. The choice tour company for National Geographic, the BBC and Discovery Channel; their focus on nature, ecology and fun will make your excursions unique and unforgettable. Shelter Cove Marina is the home of the giant bronze statue of Neptune, God of water. Not only is this Neptune statue the landmark of Shelter Cove, but he is also one of the world’s largest working sundials. Centrally located, Shelter Cove is one of the most popular areas on the island. Featuring boutique style shops, local restaurants and events galore, this area is a definite family favorite. Every Tuesday, in the summer, you and your family are invited to Harbourfest, Shelter Cove’s signature event! You will enjoy live entertainment and fireworks every Tuesday night from June 22 – August 10. The famous Shannon Tanner will also delight the kids, and the kids at heart, with his high-energy performances. Families return year after year to see his shows. Shannon will kick off his shows this year on Thursday April 15th at 6:30pm. He will continue one show per night, Wednesday through Saturday at 6:30, through Memorial Day Weekend. From June 1 through September 5, Shannon will offer two one-hour shows each night at 6:30 and 8:00pm, Monday through Friday. Visit the Shannon Tanner Concert website for more details. Coligny Plaza is known as Hilton Head’s ‘downtown’ area. Coligny is easily accessible by foot, bike and car to find and is the location of the most popular public beach access on the island. Established in 1956, this is also the oldest shopping center on the island. With 80 spectacular locally owned shops, restaurants and bars, this is a must do for your family. South Beach Marina is a visitor favorite on the island. 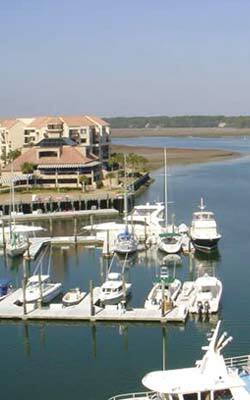 Located at the ‘toe’ of the island—Hilton Head is shaped like a shoe—this marina has everything you are looking for. This small marina is modeled after a New-England style fishing village. The village is filled with gift and souvenir shops, restaurants and tons of water activities from parasailing to jet skies to zodiac dolphin cruises. The night brings on a whole new kind of fun; outdoor entertainment is a nightly event where the sound of Jimmy Buffet and the screams of delight of children fill the air. The outdoor bar at Salty Dog Cafe is the place to be on the hot summer nights where face painting and ice cream bars will keep the kids happy! Harbour Town Marina is one of the most well known spots on the island; this is home to our landmark Hilton Head Island lighthouse. The marina is filled with relaxing rocking chairs under the shade of old oaks, local boutiques, and great restaurants. At night, the party starts for the kids with nightly concerts by Gregg Russell under the famous Liberty Oak. Harbour Town is also home to the Harbour Town cruise boats, Vagabond, Spirit of Harbour Town, and Stars and Stripes. Kayaking is one of Hilton Head’s favorite activities. Paddle through Hilton Head’s tidal creeks and salt marshes with knowledgeable guides. Kayaking is fun, safe, and easy—making it the perfect activity for the whole family to enjoy. 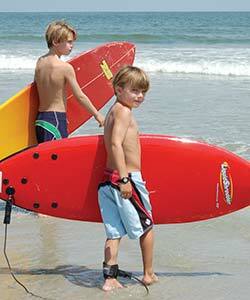 Paddling boarding is fun, easy to learn, and a great workout! Parasailing is a great way to see Hilton Head from a “bird’s eye” view. Fly through the air on your own or with a friend, you’ll be able to see the lighthouse and the bridges and probably dolphins below. See Hilton Head like you never have seen it before. Jetski/waverunner is an exciting way to get around on the water. Rent a waverunner for the day or just a couple of hours. Zipline Hilton Head is just the start of the thrills and family fun you’ll find with us in the heart of Hilton Head Island, South Carolina. If you’re looking for more of a recreational, fun-filled adventure on the water, H20 Sports Hilton Head Island is the place to cool off. Offering parasailing, kayaking, paddle boarding, sailing, waterskiing and banana boat rides, they offer the best experience you can have on the water for all ages.